The Kurdistan Workers' Party or PKK (Kurdish: Partiya Karkerên Kurdistanê‎) is a Kurdish far-left militant and political organization based in Turkey and Iraq. Since 1984 the PKK has been involved in an armed conflict with the Turkish state (with a two-year cease-fire during 2013–2015), with the initial aim of achieving an independent Kurdish state, later changing it to a demand for equal rights and Kurdish autonomy in Turkey. Cultural & political rights for the Kurdish population in Turkey. Ongoing war with Turkey, after ceasefire ended. The group was founded in 1978 in the village of Fis (near Lice) by a group of Kurdish students led by Abdullah Öcalan. The PKK's ideology was originally a fusion of revolutionary socialism and Kurdish nationalism, seeking the foundation of an independent Communist state in the region, which was to be known as Kurdistan. The initial reasons given by the PKK for this were the oppression of Kurds in Turkey and Capitalism. By then, the use of Kurdish language, dress, folklore, and names were banned in Kurdish-inhabited areas. The words "Kurds", "Kurdistan", or "Kurdish" were officially banned by the Turkish government temporarily. Following the military coup of 1980, the Kurdish language was officially prohibited in public and private life. Many who spoke, published, or sang in Kurdish were arrested and imprisoned. The PKK was then formed, as part of a growing discontent over the suppression of Turkey's ethnic Kurds, in an effort to establish linguistic, cultural, and political rights for Turkey's ethnic Kurdish minority. Since the PKK's foundation, it has been involved in armed clashes with Turkish security forces. The full-scale insurgency, however, did not begin until 15 August 1984, when the PKK announced a Kurdish uprising. Since the conflict began, more than 40,000 have died, most of whom were Turkish Kurdish civilians. Since PKK leader Öcalan's capture and imprisonment in 1999, he has moved on from Marxism–Leninism, leading the party to adopt his new political platform of democratic confederalism while ceasing its official calls for the establishment of a fully independent country. In May 2007, former members of the PKK helped form the Kurdistan Communities Union (KCK), an umbrella organisation of Kurds from Turkey, Iran, Iraq, and Syria. In 2013, the PKK declared a ceasefire agreement and began slowly withdrawing its fighters to the Kurdistan Region of northern Iraq as part of the solution process between the Turkish state and the Kurdish minority. In July 2015, the PKK announced that a ceasefire was over and said that Ankara had welched on its promises regarding the Kurdish issue. In August 2015, the PKK announced that they would accept another ceasefire with Turkey only under US guarantees. The PKK is listed as a terrorist organization by several states and organizations, including the North Atlantic Treaty Organization (NATO), the United States, the United Kingdom, Japan, and the European Union. However, the United Nations and countries such as Switzerland, China, India, Russia and Egypt, have not designated the PKK as a terrorist organization. In the early 1970s, the organization's core group was made up largely of students led by Abdullah Öcalan ("Apo") in Ankara. By then, the use of Kurdish language, dress, folklore, and names were banned in Kurdish-inhabited areas. In an attempt to deny their existence, the Turkish government categorized Kurds as "Mountain Turks" until 1991. The words "Kurds", "Kurdistan", or "Kurdish" were officially banned by the Turkish government. Following the military coup of 1980, the Kurdish language was officially prohibited in public and private life. Many who spoke, published, or sang in Kurdish were arrested and imprisoned. The PKK was then formed, as part of a growing discontent over the suppression of Turkey's ethnic Kurds, in an effort to establish linguistic, cultural, and political rights for Turkey's ethnic Kurdish minority. The group focused to the large oppressed Kurdish population in south-east Turkey. A meeting on 25 November 1978, in a tea house near Diyarbakır is considered the founding meeting. On 27 November 1978, the group adopted the name Kurdistan Workers' Party. Espousing a Marxist ideology, the group took part in violent conflicts with right-wing entities as a part of the political chaos in Turkey at the time. The group tried to assassinate the Kurdish tribal leader Mehmet Celal Bucak in 1979. According to the PKK sources, he was exploiting the peasants, and collaborated with Turkey in oppressing the Kurds. It is believed that this marked a period of intense urban warfare among other political elements. Turkish sources claimed that the 1980 Turkish coup d'état pushed the organization to another stage, with members being executed, doing jail time, being subject to capital punishment, or fleeing to Syria. On 10 November 1980, it was claimed that the PKK bombed the Turkish Consulate in Strasbourg, France in a joint operation with the Armenian radical group ASALA, which they claimed as the beginning of a "fruitful collaboration." The PKK didn't take responsibility despite a numerous of accusations. Starting in 1984, the PKK transformed into a paramilitary group, using training camps in Turkey, Iraq, Syria, Lebanon and France. At the same time, some of its members started to get training by the members of the Palestine Liberation Organization who themselves were trained by Soviet personnel in Lebanon's Bekaa Valley in Syrian-controlled camps. According to the U. S. government reports, the PKK received significant support by Syria, which allowed it to maintain headquarters in Damascus, as well as by Iran, Iraq, and Libya. It later began to launch attacks and bombings against Turkish governmental installations, the military, and various institutions of the state. The organization focused on attacks against Turkish military targets in Turkey, although civilian targets were also hit. The group started to gain publicity after committing political killings and massacres. From the mid-1990s, the organization began to lose the upper hand in its operations as a consequence of a change of tactics by Turkey and Syria's steady abandonment of support for the group. The group also had lost its support from Saddam Hussein. At the same time, the government started to use more violent methods to counter Kurdish militants. From 1996 to 1999, the organization began to use suicide bombers, VBIED and ambush attacks against military and police bases. The role of suicide bombers, especially female ones were encouraged and mythologised by giving them the status of a "goddess of freedom", and shown as role models for other women after their death. On the 30th of July 1996, Zeynep Kınacı, a female PKK fighter, carried out the organization's first suicide attack, killing 8 soldiers and injuring 29 others. The attacks against the civilians, especially the Kurdish citizens who refused to cooperate with them were also reported at the same years. On 20 January, 1999, a report published by HRW, stated that the PKK was believed to have been responsible for more than 768 executions. The organization had also reportedly committed 25 massacres, killing more than 300 people. More than hundred victims were children and women. The Kurdish–Turkish conflict was in its peak in the 90's until the leader of the organization, Abdullah Öcalan, was captured, prosecuted and sentenced to death, but this was later commuted to life imprisonment as part of the government's seeking European Union membership. In the late 1990s, Turkey increased the pressure and the undeclared war between Turkey and Syria ended open Syrian support. The European Court of Human Rights has condemned Turkey for human rights abuses during the conflict. Some judgements are related to executions of Kurdish civilians, torturing, forced displacements, destroyed villages, arbitrary arrests, murdered and disappeared Kurdish journalists, activists and politicians. As a result of increasing Kurdish population and activism, the Turkish parliament began a controlled process of dismantling some anti-Kurdish legislation, using the term "normalization" or "rapprochement," depending on the sides of the issue. It partially relaxed the bans on broadcasting and publishing in the Kurdish language, although significant barriers remain. At the same time, the PKK was blacklisted in many countries. On 2 April 2004, the Council of the European Union added the PKK to its list of terrorist organizations. Later that year, the US Treasury moved to freeze assets of branches of the organization. The PKK went through a series of changes, and in 2003 it ended the unilateral truce declared when Öcalan was captured. On 20 March 2016, the PKK announced the establishment of Peoples' United Revolutionary Movement, a coalition of Maoists, Marxists-Leninists, Apoists, Communists and Hoxhaists which aim to attain "democracy and a free future" for "peoples against Imperialism, Capitalism, Chauvinism, Fascism and Racism", by working towards the overthrow of the ruling AKP government, who they deem collaborative fascist. The organization originated in the 1970s from the radical left and drew its membership from other existing leftist groups, mainly Dev-Genç. :127 During the 1980s, the movement included and cooperated with other ethnic groups, including ethnic Turks, who were following the radical left. :127:129 The organization initially presented itself as part of the worldwide communist revolution. Its aims and objectives have evolved over time towards the goal of national autonomy, and democratic confederalism. Whilst this shift has been interpreted as one from a call for independence to an autonomous republic, some scholars have concluded that the PKK still maintains independence as the ultimate goal, but through society-building rather than state-building. Followers of Öcalan and members of the PKK are known, after his dimunitive name, as Apocu (Apo-ites) under his movement, Apoculuk (Apoism). The organization has adapted the new Democratic confederalist views of its arrested leader, which aim to replace the United Nations, Capitalism and Nation State with the Democratic Federalism which is described as a "system of popularly elected administrative councils, allowing local communities to exercise autonomous control over their assets, while linking to other communities via a network of confederal councils. The PKK has multiple heads in various countries, such as Iraq, Iran, Syria, Russia and West European countries. However, Abdullah Öcalan was the unchallenged leader of the organization. After the capture of Öcalan, authorities induced him to publicly plead for a ceasefire. Though serving life imprisonment, Öcalan is still considered the honorary leader and figurehead of the organization. Murat Karayılan led the organization from 1999 to 2013. In 2013 Cemil Bayik and Besê Hozat assumed as the first joint leadership. Cemil Bayik, beside Abdullah Öcalan, Kesire Yildirim Öcalan and Haki Karer was one of the core leaders. The organization appointed "Doctor Bahoz," the nom de guerre of Fehman Huseyin, a Syrian Kurd, in charge of the movement's military operations signifying the long-standing solidarity among Kurds from all parts of Kurdistan. The first training camps were established in 1982 in Turkey, Iraq, Syria, Iran and also in Beqaa Valley with the support of the Syrian government. After the Iran-Iraq war and Kurdish civil war, the PKK moved all its camps to north Iraq in 1998. The PKK had also completely moved to Qandil Mountains from Beqaa Valley, under intensive pressure, after Syria expelled Öcalan and shut down all camps established in the region. At the time, Northern Iraq was experiencing vacuum of control after Operation Provide Comfort. Instead of a single training camp which could be easily destroyed, the organization created many small camps. During this period the organization set up a fully functioning enclave with training camps, storage facilities, and reconnaissance and communications centers. In 2007, the organization was believed to have camps strung out through the mountains that straddle the border between Turkey and Iraq, including in Sinaht, Haftanin, Kanimasi and Zap. The organization developed two types of camps. The mountain camps, located in Turkey, Iraq and Iran, are used as forward bases from which militants carry out attacks against Turkish military bases. The units deployed there are highly mobile and the camps have only minimal infrastructure. The other permanent camps, in the Qandil Mountains, have more developed infrastructure—including a field hospital, electricity generators and a large proportion of the PKK's lethal and non-lethal supplies. The organization is using Qandil mountain camps for its political activities. It was claimed in 2004 that there was another political training camp in Belgium, evidence that the organization had used training camps in Europe for political and ideological training. The organization had sympathizer parties in the Grand National Assembly of Turkey beginning in the early 1990s. The establishment of direct links to the organization has been a question. In sequence HEP/DEP/HADEP/DEHAP/DTP and the latest Peace and Democracy Party (BDP), which later changed its name to Democratic Regions Party (DBP) on 11 July 2014, have been accused of sympathizing with the PKK, since they have refused to brand it as a terrorist group. Political organizations established in Turkey are banned from propagating or supporting separatism. Several political parties supporting Kurdish rights have been allegedly banned on this pretext. The constitutional court claimed to find direct links between the HEP/DEP/HADEP and the PKK. In 2008 the DTP-party was prosecuted by the constitutional court. It is reported that Turkey has used the PKK as an excuse to close Kurdish political parties. Turkish-Kurdish politician and conspiracist Abdülmelik Fırat had claimed that Democratic Society Party (DTP) was founded by PKK, and that 80 percent of Kurds do not vote for this party. Senior DTP leaders maintain that they support a unified Turkey within a democratic framework. Aysel Tuğluk published an article in Radikal in May 2007 as the co-president of DTP, to prove that claim. Several parliamentarians and other elected representatives have been jailed for speaking in Kurdish, carrying Kurdish colors or otherwise allegedly "promoting separatism", most famous among them being Leyla Zana. The European Court of Human Rights has condemned Turkey for arresting and executing Kurdish writers, journalists and politicians in numerous occasions. Between 1990 and 2006 Turkey was condemned to pay 33 million euros in damages in 567 cases. The majority of the cases were related to events that took place in southeastern Anatolia Politicians of the HDP are often accused and prosecuted for being members of the PKK. In Iraq the political party Tevgera Azadî is said to have close to the PKK. During the controversial Ergenekon trials in Turkey, allegations have been made that the PKK is linked to elements of the Turkish intelligence community. Şamil Tayyar, author and member of the ruling AK Party, claimed that Öcalan was released in 1972 after just three months' detention on the initiative of the National Intelligence Organization (Millî İstihbarat Teşkilatı, MİT), and that his 1979 escape to Syria was aided by elements in MİT. Öcalan has admitted making use of money given by the MIT to the PKK, which he says was provided as part of MIT efforts to control him. Former police special forces member Ayhan Çarkın alleged that the state, using the clandestine Ergenekon network, colluded with militant groups such as the PKK, Dev-Sol and Turkish Hezbollah, with the goal of profiting from the war. A witness to the trials testified that General Levent Ersöz, former head of JITEM, had frequent contact with PKK commander Cemîl Bayik. According to official figures, it was claimed that nearly 2000 PKK members became itirafçı ("confessors") after their arrest. Some were persuaded or coerced to play an active role in the conflict, particularly under the direction of the Turkish Gendarmerie's unofficial JİTEM unit. During its establishment in the mid-1970s, amid violent clashes country-wide, the organization used classic violent methods, such as the alleged failed assassination of Mehmet Celal Bucak as a propaganda-of-the-deed. After the 1980 military coup, the organization developed into a paramilitary organization using resources it acquired in Syria, Russia, Europe and Beqaa Valley in part of ex-Syrian-controlled Lebanon. After 1984, PKK began also to use the Maoist theory of people's war. The PKK has faced condemnation by some countries for executing civilians, using suicide bombers, Child Soldiers and involvement in drug trafficking. In the first phase (1978–1984), the PKK tried to gain the support of the Kurdish population. It attacked the machinery of government and distributed propaganda in the region. PKK tactics were based on ambush, sabotage, riots, protests, and demonstrations against the Turkish government. During these years, the PKK also fought a turf war against other radical Islamist Kurdish and Turkish organisations in Turkey. Turkish newspapers claimed that the PKK effectively used the prison force to gain appeal among the population which PKK has denied. In the whole Turkey, this period was characterized by violent clashes which culminated in the 1980 military coup. During this time, the organization argued that its violent actions against the government forces were explained by the need to defend Kurds in the context of what it considered as the massive cultural suppression of Kurdish identity (including the 1983 Turkish Language Act Ban) and cultural rights carried out by other governments of the region. Turkey also used violent and oppressive methods against its Kurdish citizens to stop them supporting the PKK. In the second phase (1984–1999), which followed the return of civilian rule in 1983, escalating attacks were made on the government's military and vital institutions all over the country. The objective was to destabilise Turkish authority through a long, low-intensity confrontation. In addition to skirmishing with Turkish military and police forces and local village guards, the PKK has conducted bomb attacks on government and police installations. Kidnapping and assassination against government and military officials and Kurdish tribal leaders who were named as puppets of the state were performed as well. Widespread sabotages were continued from the first stage. Turkish sources had also claimed that the PKK also carried out kidnappings of tourists, primarily in Istanbul but also at different resorts. However, the PKK had in its history arrested 4 tourists and released them all after warning them to not enter the war zone. The vast majority of PKK's actions have taken place mainly in Turkey against the Turkish military, although it has on occasions co-operated with other Kurdish nationalist paramilitary groups in neighboring states, such as Iraq and Iran. The PKK has also attacked Turkish diplomatic and commercial facilities across Western Europe in the late 80's. In effect, the Turkish state has led a series of counter-insurgency operations against the PKK, accompanied by political measures, starting with an explicit denunciation of separatism in the 1982 Constitution, and including proclamation of the state of emergency in various PKK-controlled territories starting in 1983 (when the military relinquished political control to the civilians). This series of administrative reforms against terrorism included in 1985 the creation of village guard system by the then prime minister Turgut Özal. Öcalan, in presence of PUK leader Jalal Talabani declared an unilateral cease fire in 1993, and said the PKK did not want to separate from Turkey, but Turkey did not respond to it.Turkey involved in serious human rights violations during the 90's. The ECHR has condemned Turkey for executions of Kurdish civilians, torturing, forced displacements and massive arrests. In the late 1980s and early 1990s, in an effort to win increased support from the Kurdish peasantry, the PKK altered its leftist secular ideology to better accommodate and accept Islamic beliefs. The group also abandoned its previous strategy of attacking Kurdish and Turkish civilians who were against them, focusing instead on government and military targets. In its campaign, the organization has been accused of carrying out atrocities against both Turkish and Kurdish civilians and its actions have been criticised by human rights groups such as Amnesty International and Human Rights Watch. Similar actions of the Turkish state have also been criticized by these same groups. The third phase (1999–2012), after the capture of Öcalan, PKK reorganized itself and new leaders were chosen by its members. The PKK wasn't active between 2000 and 2003. The organization made radical changes to survive, such as changing ideology and setting new goals. At the same time, the PKK continued to recruit new members and sustain its fighting force. According to Turkish sources, in April 2002 at its 8th Party Congress, the PKK changed its name to the Kurdistan Freedom and Democracy Congress (KADEK) and proclaimed a commitment to nonviolent activities in support of Kurdish rights. A PKK/KADEK spokesman stated that its armed wing, The People's Defense Force, would not disband or surrender its weapons for reasons of self-defense, however. This statement by the PKK/KADEK avowing it would not lay down its arms underscores that the organization maintained its capability to carry out armed operations. PKK/KADEK established a new ruling council in April, its membership virtually identical to the PKK's Presidential Council. The PKK/KADEK did not conduct an armed attack in 2002; however, the group periodically issued veiled threats that it will resume violence if the conditions of its imprisoned leader are not improved and its forces are attacked by Turkish military, and it continued its military training like before. Kongra-Gel called off the cease-fire at the start of June 2004, saying Turkish security forces had refused to respect the truce. Turkish security forces were increasingly involved in clashes with Kurdish separatist fighters. Ankara claimed that about 2,000 Kurdish fighters had crossed into Turkey from hideouts in mountainous northern Iraq in early June 2004. While the fight against the Turkish security forces between 2004 and 2010 continued, the PKK and its ancillary organizations continued to enjoy substantial support among the Kurds of Turkey. In 2005, the original name of the organization PKK was restored. Turkey's struggle against the Kongra-Gel/PKK was marked by increased clashes across Turkey in 2005. In the Southeast, Turkish security forces were active in the struggle against the Kongra-Gel/PKK. There were bombings and attempted bombings in resort areas in western Turkey and Istanbul, some of which resulted in civilian casualties. A radical Kurdish separatist group calling itself the Kurdish Freedom Hawks (TAK) claimed responsibility for many of these attacks. The TAK is a rival to PKK that since 2006 repeatedly damaged the PKK's efforts to negotiate cease-fires and unlike the PKK, is seeking to establish independent Kurdistan. In 2006 alone, the PKK claimed over 500 victims. In October 2006, the PKK allegedly declared a unilateral cease-fire that slowed the intensity and pace of its attacks, but attacks continued in response to Turkish security forces significant counterinsurgency operations, especially in the southeast. On 21 October 2011 Iranian foreign minister Ali Akbar Salehi announced Iran would co-operate with Turkey in some military operations against the PKK. 2012 was the most violent year in the armed conflict between the Turkish State and PKK since 1999. At least 541 individuals lost their lives as a result of the clashes including 316 militants and 282 soldiers. In contrast, 152 individuals lost their lives in 2009 until the Turkish government initiated negotiations with the PKK leadership. The failure of this negotiations contributed to violence that were particularly intensified in 2012. The PKK encouraged by the rising power of the Syrian Kurds increased its attacks in the same year. During the Syrian Civil War, the Kurds in Syria have established control over their own region with the help of the Turkish Kurdistan Workers' Party as well as with support from the Kurdistan Regional Government in Erbil, under President Masoud Barzani. In late 2012, the Turkish government began secret talks with Öcalan for a ceasefire. To facilitate talks, government officials transmitted letters between Öcalan in jail to PKK leaders in northern Iraq. On 21 March 2013, a ceasefire was announced. On 25 April, it was announced that the PKK would leave Turkey. Commander Murat Karayılan remarked "As part of ongoing preparations, the withdrawal will begin on May 8, 2013. Our forces will use their right to retaliate in the event of an attack, operation or bombing against our withdrawing guerrilla forces and the withdrawal will immediately stop." The semi-autonomous Kurdish region of Iraq welcomed the idea of refugees from its northern neighbor. The BDP held meetings across the region to explain the pending withdrawal to concerned citizens. "The 8th of May is a day we both anticipate and fear," explained party leader Pinar Yilmaz. "We don't trust the government at all. Many people here are afraid that once the guerrillas are gone, the Turkish military will crack down on us again." The withdrawal began as planned with groups of fighters crossing the border from southeastern Turkey to northern Iraq. Iraqi leadership in Baghdad, however, declared that it would not accept armed groups into its territory. "The Iraqi government welcomes any political and peaceful settlement", read an official statement. "[But] it does not accept the entry of armed groups to its territories that can be used to harm Iraq's security and stability." The prospect of armed Kurdish forces in northern Iraq threatens to increase tensions between the region and Baghdad who are already at odds over certain oil producing territory. PKK spokesman Ahmet Deniz sought to ease concerns stating the plan would boost democracy. "The [peace] process is not aimed against anyone," he said "and there is no need for concerns that the struggle will take on another format and pose a threat to others." It is estimated that between 1,500 and 2,000 PKK fighters resided in Turkey at the time. The withdrawal process was expected to take several months even if Iraq does not intervene to try to stop it. On 14 May 2013, the first groups of 13 male and female fighters entered Iraq's Heror area near the Metina mountain after leaving Turkey. They carried with them Kalashnikov assault rifles, light machine guns and rocket-propelled grenade launchers before a welcoming ceremony. On 29 July 2013, the PKK issued an ultimatum in saying that the peace deal would fail if reforms were not begun to be implemented within a month. In October, Cemil Bayik warned that unless Turkey resumed the peace process, the PKK would resume operations to defend itself against it. He also accused Turkey of waging a proxy war against Kurds during the Syrian Civil War by supporting other extremist rebels who were fighting them. Iraqi Kurdistan President Masoud Barzani backed the initiative saying, alongside Erdogan: "This is a historic visit for me ... We all know it would have been impossible to speak here 15 or 20 years ago. Prime Minister Tayyip Erdogan has taken a very brave step towards peace. I want my Kurdish and Turkish brothers to support the peace process." The PKK engaged the Islamic State of Iraq and the Levant (ISIL) forces in Syria in mid-July 2014 as part of the Syrian Civil War. In August the PKK engaged IS in Northern Iraq and pressured the Government of Turkey to take a stand against IS. PKK forces helped tens of thousands of Yazidis escape an encircled Mount Sinjar. In September 2014, during the Siege of Kobanî, the PKK, receiving direct U.S. military support, engaged with Islamic State forces in Syria who were attacking Kurdish city Kobane, which resulted in conflicts with Turks on the border and an end to a cease-fire that had been in place over a year. The PKK accused Turkey of supporting ISIS. The PKK participated in many offensives against ISIS in Iraq and Syria. A number of Turkish Kurds rallied in large-scale street protests, demanding that the government in Ankara take more forceful action to combat IS and to enable Kurdish militants already engaged against IS to more freely move and resupply. These protests included a PKK call for its supporters to turn out. Clashes between police and protesters killed at least 31 people. The Turkish government continued to restrict PKK-associated fighters' movement across its borders, arresting 260 People's Protection Units fighters who were moving back into Turkey. On 14 October, Turkish Air Force fighter-bombers attacked PKK positions in the vicinity of Daglica, Hakkari Province. Turkish military statements claimed that the bombings were in response to PKK attacks on a Turkish military outpost in the area. The Firat news agency, which Al Jazeera describes as "close to the PKK", claimed that Turkish forces had been shelling the PKK positions for days beforehand and that the PKK action had itself been retaliation for those artillery strikes. The PKK had already reported several Turkish attacks against their troops months before Turkish bombing started. Percentage of the popular vote won by the pro-Kurdish Peoples' Democratic Party (HDP) in the 2015 Turkish general election. "The HDP's elections results, which are a proxy indicator of popular support for the PKK, show that the group has followers throughout the country." In the months before the parliamentary election of 2015, as the "Kurdish-focused" HDP's likelihood of crossing the 10% threshold for entry into the government seemed more likely, Erdogan gave speeches and made comments that repudiated the settlement process and the existence of a Kurdish problem and refusing to recognize the HDP as having any role to play despite their long participation as intermediaries. These announcements increased distrust of the government's good faith among Kurdish leaders. In July 2015, Turkey finally became involved in the war against ISIL. While they were doing so, they decided to bomb PKK targets in Iraq. The bombings came a few days after PKK was suspected of assassinating two Turkish police officers in Ceylanpınar, Şanlıurfa, accused by the PKK of having links with ISIS after the 2015 Suruç bombing. The PKK has blamed Turkey for breaking the truce by bombing the PKK in 2014 and 2015 continuously. PKK announced a one-sided ceasefire in October 2015 near election time, but the government refused. The leadership of Iraqi Kurdistan has condemned the Turkish air strikes in its autonomous region in the north of Iraq. The number of casualties since 23 July was claimed by Turkish government to be 150 Turkish officers and over 2,000 Kurdish rebels killed (by September). In December 2015, Turkish military operation in southeastern Turkey has killed hundreds of civilians, displaced hundreds of thousands and caused massive destruction in residential areas. In March 2016, the PKK helped to launch the Peoples' United Revolutionary Movement with nine other Kurdish and Turkish revolutionary leftist, socialist and communist groups (including the TKP/ML, THKP-C/MLSPB, MKP, TKEP/L, TİKB [de; fr; tr; zh], DKP, DK and MLKP) with the aim of overthrowing the Turkish government of Recep Tayyip Erdoğan. The areas in which the group operates are generally mountainous rural areas and dense urban areas. The mountainous terrain offers an advantage to members of the PKK by allowing them to hide in a network of caves. Since its foundation, the PKK has recruited new fighters mainly from Turkey, but also from Syria, Iraq, Iran, and Western countries using various recruitment methods, such as using nationalist propaganda and its gender equality ideology. At its establishment, it included a small number of female fighters but over time, however, the number increased significantly and by the early 1990s, 30 percent of its 17,000 armed fighting forces were women. In much of rural Turkey, where male-dominated tribal structures, and conservative Muslim norms were commonplace, the organization increased its number of members through the recruitment of women from different social structures and environments, also from families that migrated to several European countries after 1960 as guest workers. It was reported by a Turkish university that 88% of the subjects initially believed that equality was a key objective, and that they joined the organization based on this claim. In 2007, approximately 1,100 of 4,500–5,000 total members were women. In its early stages, the PKK recruited young women by kidnapping them. This forced families whose children were already a member of the organization to cooperate and thus turning them into accomplices, which increased the number of women joining the group, according to the publication, published by the Jamestown Foundation. The organization is also actively recruiting child soldiers and it has been accused of abducting more than 2,000 children by Turkish Security Forces. The independent reports by the Human Rights Watch (HRW), the United Nations(UN) and the Amnesty International have confirmed the recruitment and use of child soldiers by the organization and its armed wings since the 90's. According to the TEPAV think-tank which did research on the identities of 1,362 PKK fighters who lost their lives between 2001 and 2011, 42% of the recruits were under 18, with over a quarter of these being under 15 years of age at the time of recruiting. The organization is also believed to have used the children in the drug trade. On 22 December, 2016, a report published by Human Rights Watch (HRW) stated that the HPG, the armed wing of the PKK, and the YBS, a Yazidi militia affiliated with the PKK, had actively recruited child soldiers since the 2015. The report stated that more than 29 cases had been documented, and some recruited children were under 15 when they had been recruited, which is a war crime under international law. Rifles[nb 1] 5,713 of (959 traceable) 45.2% from Russia, 13.2% from United Kingdom, and 9.4% from United States. Rocket launchers 1,610 (313 traceable) 85% from Russia, 5.4% from Iraq, and 2.5% from China in origin. Turkish authorities claimed that four members of the organization, who handed themselves over to authorities after escaping from camps in northern Iraq, claimed they had seen two U.S. armored vehicles deliver weapons, which was widely reported and further stoked suspicions about U.S. policy in Iraq. US envoy denied these claims. The arms were claimed to be part of Blackwater Worldwide arms smuggling allegations. The probe of organization's weapons and the investigation of Blackwater employees were connected. The PKK also denied claims. Parties and concerts are organized by branch groups. Additionally, it is believed that the PKK earns money through the sale of various publications, as well as receiving revenues from legitimate businesses owned by the organization, and from Kurdish-owned businesses in Turkey, Russia, Iraq, Iran and Western Europe. Besides affiliate organizations, it is claimed that there are sympathizer organizations such as the Confederation of Kurdish Associations in Europe and the International Kurdish Businessmen Union which constantly exchanges information and perform legitimate or semi-legitimate commercial activities and donations. According to the European Police Office (EUROPOL), the organization collects money from its members, using labels like ‘donations’ and ‘membership fees’ which are seen as a fact extortion and illegal taxation by the authorities. There are also indications that the organization is actively involving in money laundering, illicit drugs and human trafficking, as well as illegal immigration inside and outside the EU for funding and running its activities. PKK's involvement in drug trafficking has been documented since the 1990s. A report by Interpol published in 1992 states that the PKK, along with nearly 178 Kurdish organizations were suspected of illegal drug trade involvement. The British National Criminal Intelligence Service determined that the PKK obtained $75 million from drug smuggling in Europe in 1993 alone. Members of the PKK have been designated narcotics traffickers by the U.S. Department of the Treasury. However, The Federal Office for the Protection of the Constitution, Germany's domestic security agency, echoed this finding in its 2011 Annual Report on the Protection of the Constitution, stating that despite the U.S Department of Treasury designation, there was "no evidence that the organisational structures of the PKK are directly involved in drug trafficking". On 14 October 2009, the U.S. Department of the Treasury's Office of Foreign Assets Control (OFAC) targeted the senior leadership of the PKK, designating Murat Karayılan, the head of the PKK, and high-ranking members Ali Riza Altun and Zübeyir Aydar as foreign narcotics traffickers at the request of Turkey. On 20 April 2011, the U.S. Department of the Treasury announced the designation of PKK founders Cemîl Bayik and Duran Kalkan and other high-ranking members as Specially Designated Narcotics Traffickers (SDNT) pursuant to the Foreign Narcotics Kingpin Designation Act (Kingpin Act). Pursuant to the Kingpin Act, the designation freezes any assets the designees may have under U.S. jurisdiction and prohibits U.S. persons from conducting financial or commercial transactions with these individuals. According to research conducted by journalist Aliza Marcus, the PKK accepted the support of smugglers in the region. Aliza Marcus claimed that some of those Kurdish smuggler who involved in the drugs trade, either because they truly believed in the PKK—or because they thought it a good business practice(avoid conflicts)—frequently donated money to the PKK rebels. She also claimed that there were reports of PKK supporters in Europe who used their positions and contacts to trade in drugs—and then handed some of the profits to the PKK. And when PKK activists needed more money, they had no qualms about approaching Kurds who trafficked in narcotics. However, according to Aliza Marcus, it does not seem that the PKK, as an organization, directly produced or traded in narcotics. Following the SDF capture of Raqqa, YPJ and YPG troops raised a large banner of Abdullah Öcalan in the city centre. In 2018, the state-run new agency AA claimed that the PKK has successfully kept its drug production and trafficking activities underground, both across the globe and within Turkey, and that the security forces had carried out more than 414 drug trafficking operations against the organization since the 1980. The Turkish authorities have also claimed that the organization gains 1,5 billion USD yearly from drug trafficking. The report, published by the United Nations Office on Drugs and Crime (UNODC), stated that the instability in Iraq has helped the PKK to develop and use Iraq as a transhipment point for Afghan heroin. The PKK was reported to collect taxes per kilogram of heroin trafficked to Turkey from the Islamic Republic of Iran and Iraq borders, with potential profits reaching US$200 million annually. The EUROPOL which has monitored the organization's activities inside the EU has also reported the organization's involvement in the trafficking of drugs and human beings to raise funds for its terrorist activities inside and outside the EU. On 1 January, 2012, the U.S. Department of the Treasury's Office of Foreign Assets Control (OFAC) announced the designation of Moldovan-based individuals Zeyneddin Geleri, Cerkez Akbulut, and Omer Boztepe as specially designated narcotics traffickers for drug trafficking on behalf of the PKK in Europe. According to the OFAC, Zeynedding Geleri was identified as a high-ranking member of the PKK while two others were activists. The OFAC stated that the drug trafficking is still one of the organization's criminal activities it uses to obtain weapons and materials. 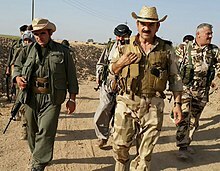 In 2008, according to information provided by the Intelligence Resource Program of the Federation of American Scientists the strength of the organization in terms of human resources consists of approximately 4,000 to 5,000 militants of whom 3,000 to 3,500 are located in northern Iraq. With the new wave of fighting from 2015 onwards, observers noted that active support for the PKK had become a "mass phenomenon" in majority ethnic Kurdish cities in the Southeast of the Republic of Turkey, with large numbers of local youth joining PKK-affiliated local militant groups. At the height of its campaign, the organization received support from many countries. According to Turkey, countries the PKK has previously/currently received support from include: Greece, Iran, Iraq, Russia and Syria. The level of support given has changed throughout this period. Official Turkish sources also allege cooperation between the PKK and the Armenian Secret Army for the Liberation of Armenia (ASALA). According to Ali Külebi, president of an Ankara-based nationalist think tank TUSAM, "It is obvious that the PKK is supported by Greece, considering the PKK's historical development with major support from Greece." Külebi alleged in 2007 that PKK militants received training at a base in Lavrion, near Athens. Retired Greek L.T. General Dimitris Matafias and retired Greek Navy Admiral Antonis Naxakis had visited the organization's Mahsun Korkmaz base camp in Lebanon's Beqaa Valley in October 1988 along with parliamentarians from the center-left PASOK. At the time it was reported that the general had assumed responsibility for training. Greeks also dispatched arms through the Republic of Cyprus. In December 1993, Greek foreign affairs minister Theodoros Pangalos was quoted as saying "we must be supportive of the Kurdish people to be free". Greece declined to join Germany and France and the eleven other members at the EU to ban the organization. During his trial, Öcalan admitted, as quoted in Hürriyet, that "Greece has for years supported the PKK movement. They even gave us arms and rockets. Greek officers gave guerrilla training and explosives training to our militants" at a camp in Lavrion, Greece. From early 1979 to 1999, Syria had provided valuable safe havens to PKK in the region of Beqaa Valley. However, after the undeclared war between Turkey and Syria, Syria placed restrictions on PKK activity on its soil such as not allowing the PKK to establish camps and other facilities for training and shelter or to have commercial activities on its territory. Syria recognized the PKK as a terrorist organization in 1998. Turkey was expecting positive developments in its cooperation with Syria in the long term, but even during the course of 2005, there were PKK operatives of Syrian nationality operating in Turkey. Iran provided PKK with supplies in the form of weapons and funds. However, Iran later listed the PKK as a terrorist organization after Party for a Free Life in Kurdistan used Iran's supply of resources to the PKK on its own soil. Turkish and Azeri sources have alleged in 2007 that PKK maintains camps in the Armenian-controlled Nagorno-Karabakh Republic. Armenia's Deputy Foreign Minister Arman Kirakosyan called these allegations "sheer nonsense" in 2008. In May 2008 a commentary in the right-wing newspaper Yeni Şafak claimed that the PKK's leadership, "perhaps feeling insecure in northern Iraq, was mulling a move to Nagorno-Karabakh." In response, Armenia's Foreign Ministry press spokesman Vladimir Karapetian stated, "The unsubstantiated rumors about the intentions on the side of the Kurdistan Workers' Party (PKK) to move to Nagorno-Karabakh and controlled territories cannot be called anything less than another provocation." Support of the Republic of Cyprus was alleged when Abdullah Öcalan was caught with a Cypriot passport under the name of Mavros Lazaros, a nationalist reporter. Former KGB-FSB officer Alexander Litvinenko alleges that PKK's leader Abdullah Öcalan was trained by KGB-FSB. As of 2008, Russia is still not among the states that list PKK as a terrorist group despite intense Turkish pressure. MED TV broadcast for five years in the UK, until its license was revoked by the regulators the Independent Television Commission (ITC) in 1999. The PKK has been listed as a terrorist organization since 29 March 2001. In 2008, the United Kingdom detained members of the PKK and seized the assets of the PKK's representative in Britain, Selman Bozkur, alias "Dr. Hüseyin". His assets remain frozen. The Dutch police had allegedly raided the 'PKK paramilitary camp' in the Dutch village of Liempde and arrested 29 people in November 2004, but all were soon released. Denmark allows Kurdish satellite television stations (such as ROJ-TV), which Turkey claims has links with the PKK, to operate in Denmark and broadcast into Turkey. Various PKK leaders, including Hidir Yalcin, Riza Altun, Zubeyir Aydar, and Ali Haydar Kaytan all lived in Europe and moved freely. The free movement was achieved by strong ties with influential persons. Danielle Mitterrand, the wife of the former President of France François Mitterrand, had active connections during the 90s with elements of the organization's leadership that forced a downgrade in relationships between the two states. After harboring him for some time, Austria arranged a flight to Iraq for Ali Rıza Altun, a suspected key figure with an Interpol arrest warrant on his name.. Turkish foreign minister Abdullah Gül summoned the Austrian ambassador and condemned Austria's action. On 30 September 1995, while Öcalan was in Syria, Damascus initiated contact with high-ranking German CDU MP Heinrich Lummer and German intelligence officials. The Chief of the Turkish General Staff during 2007, General Yaşar Büyükanıt, stated that even though the international struggle had been discussed on every platform and even though organizations such as the UN, NATO, and EU made statements of serious commitment, to this day the necessary measures had not been taken. According to Büyükanıt; "this conduct on one side has encouraged the terrorists, on the other side it assisted in widening their activities. " Sedat Laçiner, of the Turkish think tank ISRO, says that US support of the PKK undermines the US War on Terror. Seymour Hersh claimed that the U.S. supported PEJAK, the Iranian branch of the PKK. The head of the PKK's militant arm, Murat Karayılan, claimed that Iran attempted to recruit the PKK to attack coalition forces, adding that Kurdish guerrillas had launched a clandestine war in north-western Iran, ambushing Iranian troops. The PKK has been placed on Turkey's terrorist list, as well as a number of allied governments and organizations. In 2018, the United States offered a $12 million reward for information on three PKK leaders. The military alliance NATO has declared the PKK to be a terrorist group; Turkey has been a member of NATO since 1952, and fields the group's second-largest armed contingent. Closely tied to NATO, the European Union—which Turkey aspires to join—officially lists the PKK as having "been involved in terrorist acts" and proscribes it as part of its Common Foreign and Security Policy. First designated in 2002, the PKK was ordered to be removed from the EU terror list on 3 April 2008 by the European Court of First Instance on the grounds that the EU failed to give a proper justification for listing it in the first place. However, EU officials dismissed the ruling, stating that the PKK would remain on the list regardless of the legal decision. The PKK has never been designated as a terrorist organization by the UN. The PKK is designated as a Foreign Terrorist Organization by the US State Department and a Proscribed Organisation in the United Kingdom under the Terrorism Act 2000. U.S. Vice President Joe Biden stated in January 2016 that PKK "is a terrorist group plain and simple. And what they continue to do is absolutely outrageous." Additionally, France prosecutes Kurdish-French activists and bans organizations connected to the PKK on terrorism-related charges, having listed the group as a terrorist organization since 1993. However, French courts often refuse to extradite captured individuals accused of PKK connections to Turkey due to technicalities in French law, frustrating Turkish authorities[not in citation given]. On the other hand, Russia has long ignored Turkish pressure to ban the PKK, and the group is also not included in the official terror blacklist of China (PRC), Brazil, Switzerland, India and Egypt. Australia, Austria, Azerbaijan, Canada, Czech Republic, Germany, Iran, Japan, Kazakhstan, Kyrgyzstan, the Netherlands, New Zealand, Spain, Syria. British Prime Minister Theresa May used the phrase "Kurdish terrorism". Notably, the government of Switzerland has rejected Turkish demands to blacklist the PKK, though it has taken its own measures to monitor and restrict the group's activities on Swiss soil, including banning the collection of funds for the group in November 2008. Switzerland consider only those organizations as a terrorist organizations which are in the terrorist list of the United Nations. The name PKK also includes its armed wing, the Kurdish People's Defence Force (Hêzên Parastina Gel, HPG), formerly called the Kurdistan National Liberty Army (ARGK). 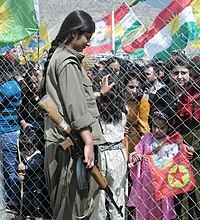 Wikimedia Commons has media related to PKK. ^ Jones, Owen (10 March 2015). "Why the revolutionary Kurdish fight against Isis deserves our support". The Guardian. Retrieved 30 September 2015. ^ Jones, Owen (10 March 2015). "PKK: Kurdistan Workers' party". The Guardian. Retrieved 20 February 2008. ^ de Jong, Alex. "The New-Old PKK". Jacobin Magazine. Retrieved 6 February 2019. ^ Can, Eyüp (14 July 2013). "PKK Changes Leadership". (trans. Timur Göksel). Al-Monitor. Archived from the original on 22 February 2014. Retrieved 5 February 2014. Originally published as Karayılan'ı kim niye gönderdi? in Radikal, 11 July 2013. ^ Bila, Fikret (7 November 2007). "Kenan Evren: 'Kürtçeye ağır yasak koyduk ama hataydı'" (in Turkish). Milliyet. Retrieved 30 July 2008. Şimdi İmralı'dan PKK'yı yönetiyor. Cezaevinden avukatları kanalıyla. ^ "Ojalan: Which way now?". BBC News. 21 November 2000. Retrieved 1 September 2007. ^ "Terrorist Organization Profiles – START – National Consortium for the Study of Terrorism and Responses to Terrorism". Start.umd.edu. Retrieved 14 August 2014. ^ Howard, Michael (13 May 2005). "Radical firebrand who led bloody nationalist war". The Guardian. London. Retrieved 1 August 2008. ^ a b Jongerden, Joost. "Rethinking Politics and Democracy in the Middle East" (PDF). Retrieved 8 September 2013. ^ a b "War against Isis: PKK commander tasked with the defence of Syrian Kurds claims 'we will save Kobani'". The Independent. Retrieved 25 June 2015. ^ a b "BREAKING: HPG operation in Sinjar; 20 ISIS dead". Archived from the original on 26 June 2015. Retrieved 25 June 2015. ^ "The PKK in Numbers". Sabah (in Turkish). 28 December 2015. ^ "ANF – Ajansa Nûçeyan a Firatê". Archived from the original on 14 April 2015. Retrieved 25 June 2015. ^ White, Paul (2015). The PKK: Coming Down from the Mountains. Zed Books Ltd. ISBN 9781783600403. Retrieved 24 July 2017. ^ Stanton, Jessica A. (2016). Violence and Restraint in Civil War: Civilian Targeting in the Shadow of International Law. Cambridge University Press. p. 217. ISBN 9781107069107. Retrieved 24 July 2017. ^ Bilgin, Fevzi; Sarihan, Ali, eds. (2013). Understanding Turkey's Kurdish Question. Lexington Books. p. 90. ISBN 9780739184035. ^ Balci, Ali (2016). The PKK-Kurdistan Workers’ Party's Regional Politics: During and After the Cold War. Springer. p. 96. ISBN 3319422197. ^ a b c Hannum, Hurst (1996). Autonomy, sovereignty, and self-determination: the accommodation of conflicting rights (Rev. ed.). Philadelphia: Univ. of Pennsylvania Press. pp. 187–9. ISBN 0-8122-1572-9. ^ a b Baser, Bahar (2015). Diasporas and Homeland Conflicts: A Comparative Perspective. Ashgate Publishing. p. 63. ISBN 1-4724-2562-6. ^ a b Aslan, Senem (2014). Nation Building in Turkey and Morocco. Cambridge University Press. p. 134. ISBN 1107054605. ^ a b Joseph, J. (2006). Turkey and the European Union internal dynamics and external challenges. Basingstoke [England]: Palgrave Macmillan. p. 100. ISBN 0230598587. ^ Eder, Mine (2016). "Turkey". In Lust, Ellen. The Middle East (14 ed.). CQ Press. ISBN 1506329306. The Turkish military responded with a ferocious counterinsurgency campaign that led to the deaths of nearly 40,000 people, most of them Turkish Kurdish civilians, and the displacement of more than three million Kurds from southeastern Turkey. ^ "PKK group says Turkish ceasefire over". Rudaw. Retrieved 1 January 2016. ^ "PKK urges US to mediate in its war with Turkey and admits to secret talks with Washington". The Daily Telegraph. Retrieved 1 January 2016. ^ "Turkey – Linguistic and Ethnic Groups". Countrystudies.us. Retrieved 27 December 2018. ^ Bartkus, Viva Ona, The Dynamic of Secession, (Cambridge University Press, 1999), 90–91. ^ Çelik, Yasemin (1999). Contemporary Turkish foreign policy (1. publ. ed.). Westport, Conn.: Praeger. p. 3. ISBN 9780275965907. ^ Letsch, Constanze (10 January 2013). "Sakine Cansiz: 'a legend among PKK members'". The Guardian. Retrieved 10 January 2013. ^ MIPT Terrorism Knowledge Base. "Incident Profile: Armenian Secret Army for the Liberation of Armenia (ASALA) and Kurdistan Workers' Party (PKK) attacked Diplomatic target (November 10, 1980, France)". Archived from the original on 30 September 2007. Retrieved 17 April 2007. ^ Shaikh, Thair (23 May 2007). "PKK suicide bomb attack in Ankara". The Independent. London. Retrieved 17 July 2011. ^ "Paris'te Sabah'a PKK Saldırısı". Sabah. Retrieved 17 July 2011. ^ "After Saddam Hussein – 92.12". Theatlantic.com. Retrieved 27 December 2018. ^ a b "Rights Group Decries Missed Opportunity to Prosecute PKK Leader". Human Rights Watch. 20 January 1999. Retrieved 27 December 2018. ^ Pape, Robert (2005). Dying to Win: The Strategic Logic of Suicide Terrorism. Random House. ISBN 1588364607. ^ Alakoc, Burcu (2007). The Motivations of Female Suicide Bombers from a Communication Perspective. ProQuest. p. 4. ISBN 0549422536. ^ Gunes, Cengiz; Zeydanlioglu, Welat (23 September 2013). "The Kurdish Question in Turkey: New Perspectives on Violence, Representation and Reconciliation". Routledge. Retrieved 27 December 2018 – via Google Books. ^ UNESCO. 2002. "Death penalty abolished in Turkey Archived 29 June 2009 at the Wayback Machine". The new Courier n°1. ^ Suri, Sanjay (11 May 2005). "Torture and Oppression of Kurds in Syria". antiwar.com. ^ "Inside the Kurdistan Workers Party (PKK)". Council on Foreign Relations. Retrieved 27 December 2018. ^ "The European Court of Human Rights: Case of Benzer and others v. Turkey" (PDF). 24 March 2014: 57. Retrieved 29 December 2015. ^ McKiernan, Kevin (2006). The Kurds: a people in search of their homeland (1st ed.). New York: St. Martin's Press. p. 130. ISBN 0312325460. ^ Neuberger, Benyamin (2014). Bengio, Ofra, ed. Kurdish awakening : nation building in a fragmented homeland. [S.l. ]: Univ of Texas Press. p. 27. ISBN 0292758138. ^ Gunes, Cengiz; Zeydanlioğlu, Welat (2014). The Kurdish question in Turkey : new perspectives on violence, representation, and reconciliation. Hoboken: Taylor and Francis. p. 98. ISBN 1135140634. ^ "Police arrest and assistance of a lawyer" (PDF). Echr.coe.int. ^ "Justice Comes from European Court for a Kurdish Journalist". Khrp.org. Retrieved 1 January 2016. ^ Whitman, Lois (1993). Laber, Jeri, ed. The Kurds of Turkey: killings, disappearances and torture. New York: Human Rights Watch. ISBN 1564320960. ^ Panico, Christopher (1999). Turkey : violations of free expression in Turkey. New York: Human Rights Watch. pp. 37–8. ISBN 1564322262. ^ "Kurdish rebels abandon truce". BBC. 2 September 2003. Retrieved 1 September 2007. ^ a b "Peoples' United Revolutionary Movement established for a joint struggle". Firat News Agency. 12 March 2016. Archived from the original on 14 March 2016. Retrieved 14 March 2016. ^ a b c d Jongerden, Joost. "PKK," CEU Political Science Journal. Vol. 3, No. 1, page 127–132. ^ Arin, Yado. "Turkey and the Kurds – From War to Reconciliation?". Working Paper at UC Berkeley's Center for Right-Wing Studies. Retrieved 28 December 2018. ^ Self, Andrew (3 February 2013). "What Was It All For?". Huffington Post. Retrieved 24 July 2017. ^ "Who are Kurdistan Workers' Party (PKK) rebels?". BBC News. 4 November 2016. Retrieved 24 July 2017. ^ Yavuz, M. Hakan (2009). Secularism and Muslim Democracy in Turkey. Cambridge University Press. pp. 176–77. ISBN 9780521888783. ^ Casier, Marlies. "Beyond Mesopotamia? The Mesopotamia Social Forum and the appropriation and re-imagination of Mesopotamia by the Kurdish movement" in Gambetti, Zeynep; Jongerden, Joost, eds. (2015). The Kurdish Issue in Turkey: A Spatial Perspective. Routledge. ISBN 9781317581529. ^ Akkaya, Ahmet Hamdi; Jongerden, Joost. "The PKK in the 2000s" in Marlies, Casier; Jongerden, Joost, eds. (2010). Nationalisms and Politics in Turkey: Political Islam, Kemalism and the Kurdish Issue. Routledge. p. 156. ISBN 9781136938672. ^ Andrew Mango (2005). Turkey and the War on Terror: For Forty Years We Fought Alone. Taylor & Francis. p. 32. ISBN 978-0-415-35002-0. ^ "Democratic Confederalism" (PDF). Freeocalan.org. Retrieved 28 December 2018. ^ White, Paul (2015). The PKK: Coming Down from the Mountains. London: Zed Books Ltd. p. 26. ISBN 9781783600403. ^ Brandon, James. "The PKK and Syria's Kurds Archived 7 November 2007 at the Wayback Machine," Global Terrorism Analysis, Jamestown Foundation Volume 5, Issue 3 (15 February 2007). ^ "The Workers' Party of Kurdistan (PKK)". Republic of Turkey, Ministry of Foreign Affairs. Retrieved 9 October 2008. ^ a b Hooper, Simon (11 October 2007). "PKK's decades of violent struggle". CNN. Retrieved 10 October 2008. ^ a b c Jenkins, Gareth. "Turkey Weighs Military Options Against PKK Camps in Iraq". Archived from the original on 7 November 2007. Retrieved 2008-12-18. CS1 maint: BOT: original-url status unknown (link), Global Terrorism Analysis, Volume 4, Issue 33 16 October 2007. ^ "Report Of The Committee Against Torture," United Nations OHCHR, 2004, pages 276–277. ^ "Turkey Takes Aim at the Kurds". Geopoliticalmonitor.com. ^ "BDP'nin adı Demokratik Bölgeler Partisi oldu". Evrensel. 11 July 2014. Retrieved 24 February 2015. ^ Kilic, Ecevit (26 October 2008). "Öcalan'la ilk görüşen paşa Çevik Bir". Sabah (in Turkish). Retrieved 4 January 2009. ^ Tuğluk, Aysel (27 May 2007). "Sevr travması ve Kürtlerin empatisi". Radikal (in Turkish). Archived from the original on 3 March 2009. Retrieved 28 August 2008. ^ "Önderimiz 99'da İmralı'daydı". Hürriyet Daily News (in Turkish). Retrieved 19 July 2007. "in 99 our leader [Abdullah Öcalan, leader of the PKK] was in İmralı" which led the crowd to chant "Long live Chairman Apo" (Kurdish: Bijî Serok Apo‎) the nickname of Öcalan. ^ "JİTEM's illegal actions cost Turkey a fortune". 6 June 2012. Archived from the original on 6 June 2012. Retrieved 27 December 2018. ^ "Former head of Turkey pro-Kurdish party sentenced to 4 years in..." Reuters. 2018-09-07. Retrieved 2019-01-12. ^ Bozarslan, Mahmut (2018-12-08). "Iraqi Kurdish party pushes PKK aside". Al-Monitor. Retrieved 2019-01-12. ^ Kilic, Ecevit (22 October 2008). "Çarkın'ın itiraflarına soruşturma". Sabah (in Turkish). Retrieved 8 January 2009. ^ Radu, Michael (Winter 2001). "The Rise and Fall of the PKK". Orbis. 45 (1): 47–63. doi:10.1016/S0030-4387(00)00057-0. Archived from the original on 8 July 2007. Retrieved 29 June 2008. ^ Ute Reissner and Justus Leicht (12 March 1999). "The politics of the PKK (Kurdish Workers Party): A balance sheet". World Socialist. ICFI. Retrieved 29 June 2008. ^ "Condemnation of Ankara terror attack grows". Aa.com.tr. Retrieved 27 December 2018. ^ "PKK claims deadly suicide bombing at Turkish police station". Middle East Eye. Retrieved 27 December 2018. ^ a b "Child soldiers in ISIS, PKK, Boko Haram…" (PDF). Hrwf.eu. Retrieved 28 December 2018. ^ "Turkey". U.S. Department of State. Retrieved 27 December 2018. ^ "Eski Dışişleri Bakanı Hikmet Çetin: PKK'nın temeli 12 Eylül'de atıldı". Zaman (in Turkish). Cihan News Agency. 3 December 2007. Archived from the original on 14 January 2009. Retrieved 9 July 2008. PKK aslında nereden şiddetle çıktı. Bana göre Diyarbakır Cezaevi'nden, 12 Eylül'den sonra çıktı. Yani ortam, orada hazırlandı. Çıkış yeri orası. Orada işkenceden insanlar öldü. Sakat kalanlar Avrupa'ya gitti. Öyle bir ortamda. ^ McDowall, David (August 2011). A Modern History of the Kurds. p. 443. ^ Eager, Paige Whaley (2008). From Freedom Fighters to Terrorists: Women and Political Violence. Ashgate Publishing, Ltd. p. 175. ISBN 9780754672258. ^ "Group Profile: Kurdistan Workers' Party (PKK)". MIPT Terrorism Knowledge Base. Archived from the original on 9 January 2008. Retrieved 17 April 2007. ^ "No Security Without Human Rights". Amnesty International. Retrieved 26 September 2017. ^ "Turkey and War in Iraq: Avoiding Past Patterns of Violation". Human Rights Watch. Retrieved 26 September 2017. ^ a b Akkaya, Ahmet Hamdi; Jongerden, Joost (2010). "The PKK in the 2000s: Continuity through Breaks?". In Casier, Marlies; Jongerden, Joost. Nationalisms and Politics in Turkey: Political Islam, Kemalism and the Kurdish Issue. Routledge. p. 149. ISBN 9781136938672. ^ Brandon, James. "The Kurdistan Freedom Falcons Emerges as a Rival to the PKK". The Jamestown foundation. The Jamestown foundation. Retrieved 17 March 2016. ^ "Turkey, Iran to Cooperate Against Kurdish Rebels". Voice of America. Retrieved 10 December 2012. ^ Güneş Murat Tezcür,"Prospects for Resolution of the Kurdish Question: A Realist Perspective, Archived 16 October 2013 at the Wayback Machine" Insight Turkey 15 (Spring 2013): 69–84. ^ Salem, Paul (29 November 2012). "INSIGHT: Iraq's Tensions Heightened by Syria Conflict". Middle East Voices. Retrieved 3 November 2012. ^ a b "Peace at the end of a long PKK struggle?". Al Jazeera. 9 May 2013. Retrieved 10 May 2013. ^ "Planned PKK pullout heats up Turkey politics". Retrieved 25 June 2015. ^ a b "Kurds dare to hope as PKK fighters' ceasefire with Turkey takes hold". The Guardian. 7 May 2013. Retrieved 10 May 2013. ^ "PKK sets date for withdrawal from Turkey". Retrieved 25 June 2015. ^ a b c d "Baghdad opposes PKK armed groups in Iraq". Al Jazeera. 9 May 2013. Retrieved 10 May 2013. ^ PKK fighters arrive in Iraq under peace deal – Middle East. Al Jazeera. Retrieved 15 July 2013. ^ "PKK sets ultimatum for Turkey peace deal – Europe". Al Jazeera. Retrieved 14 August 2014. ^ "PKK threatens to renew fight in Turkey – Europe". Al Jazeera. Retrieved 14 August 2014. ^ "Iraq's Kurdistan backs Turkey peace efforts – Middle East". Al Jazeera. Retrieved 14 August 2014. ^ "PKK joins battle against Isil". Gulf News. 15 July 2014. Retrieved 14 August 2014. ^ Dorian Jones. "Turkish Kurds Want Ankara to Declare Stance on ISIL". Voice of America. Retrieved 14 August 2014. ^ "Forming the anti-ISIL Front – VERDA ÖZER". Hürriyet Daily News. 13 September 2011. Retrieved 14 August 2014. ^ Joe Parkinson (18 August 2014). "Iraq Crisis: Kurds Push to Take Mosul Dam as U.S. Gains Controversial Guerrilla Ally". The Wall Street Journal. Retrieved 21 August 2014. ^ D. Phillips & K. Berkell (Feb 2016). "The Case for Delisting the PKK as a Foreign Terrorist Organization" LAWFARE (Hard National Security Choices). Retrieved 12 December 2016. ^ "Kurdish militants claim deadly ambush in Turkey's southeast". Middle East Eye. Retrieved 25 June 2015. ^ "Exclusive: Inside the PKK's front-line fight against ISIL". Al Jazeera. 11 June 2015. Retrieved 11 June 2015. ^ "Kurds protest against Turkey as IS advances on Kobane". BBC News. 7 October 2014. Retrieved 14 October 2014. ^ "Turkish jets bomb Kurdish PKK rebels near Iraq". BBC News. 14 October 2014. Retrieved 14 October 2014. ^ "Turkey bombs Kurdish PKK targets in south". Al Jazeera. 14 October 2014. Retrieved 14 October 2014. ^ Bezci, Egemen; Borroz, Nicholas (22 September 2015). "The renewed Turkey-PKK conflict has shattered the illusion that Kurds can participate legitimately in Turkey's political system". London School of Economics. ^ "Will Erdogan's backtracking torpedo PKK disarmament? – Al-Monitor: the Pulse of the Middle East". Al-Monitor. Archived from the original on 3 March 2016. ^ "Turkey, US to create 'ISIL-free zone' inside Syria – DIPLOMACY". Hurriyetdailynews.com. ^ "Kurdish group claims 'revenge murder' on Turkish police". Al Jazeera. The armed wing of the outlawed Kurdistan Workers' Party (PKK) has claimed responsibility for killing two Turkish police officers, saying the murders were reprisals for a suicide attack in the border town of Suruc. 'A punitive action was carried out... in revenge for the massacre in Suruc,' the People's Defence Forces (HPG) said in a statement on its website on Wednesday, accusing the two officers of cooperating with the Islamic State of Iraq and the Levant (ISIL). The two police officers were found shot dead at their home in the town of Ceylanpinar on the border with Syria, two days after the Suruc suicide attack that killed 32 people, mostly ethnic Kurds. ^ Capelouto, Susanna; Tuysuz, Gul (25 July 2015). "Turkey arrests hundreds of suspected terrorists, Prime Minister says". CNN. 'We will not stay silent in the face of those who kill our police officers in their sleep,' Davutoglu said, referring to PKK's assassination of two Turkish police officers Wednesday. [...] The statement also referred to the slaying of the two police officers, calling it an act of "retribution" carried out by "local branches" without orders from central PKK command. ^ "Scores killed in clashes between Turkish forces and Kurdish rebels". Al Jazeera. 29 September 2015. ^ "Turkey's Campaign Against Kurdish Militants Takes Toll on Civilians". The New York Times. 30 December 2015. ^ "Turkey: Mounting Security Operation Deaths". Human Rights Watch. 22 December 2015. ^ a b c d Ali Özcan, Nihat "PKK Recruitment of Female Operatives". Archived from the original on 15 September 2007. Retrieved 2010-08-23. CS1 maint: BOT: original-url status unknown (link), Global Terrorism Analysis, Jamestown Foundation, Volume 4, Issue 28, 11 September 2007. ^ "Hepsi kandırılmış çocuklar". Hürriyet Daily News (in Turkish). University of Ankara. Retrieved 9 June 2007. ^ Hunsicker, A. (27 December 2018). "Understanding International Counter Terrorism: A Professional's Guide to the Operational Art". Universal-Publishers. p. 40. Retrieved 27 December 2018 – via Google Books. ^ Cragin, Kim; Daly, Sara A. (27 December 2018). "Women as Terrorists: Mothers, Recruiters, and Martyrs". ABC-CLIO. p. 67. Retrieved 27 December 2018 – via Google Books. ^ a b "Iraq: Armed Groups Using Child Soldiers". Human Rights Watch. 22 December 2016. Retrieved 27 December 2018. ^ "Refworld – Child Soldiers Global Report 2001 – Turkey". Refworld.org. Retrieved 27 December 2018. ^ "Child Soldiers Global Report 2008" (PDF). Justice.gov. Retrieved 28 December 2018. ^ "USA: PKK Taking Children as Weapons in Turkey – Anadolu Türk Haber". Anadoluturkhaber.com. Retrieved 27 December 2018. ^ a b "İşte PKK'nın silahlarının listesi". Hürriyet Daily News (in Turkish). Retrieved 19 July 2007. ^ Ozbag, Didem (23 July 2008). "I saw on TV that PKK terrorists are saying that the US is supplying weapons to PKK members in camps in Kandil Mountain. How do you respond?". Ask the Ambassador Archives. Embassy of the United States. Archived from the original on 20 July 2008. Retrieved 23 July 2008. ^ "Blackwater admits employees illegally sold weapons," Tehran Times, 23 September 2007. ^ a b "Kurdistan Worker's Party (PKK)". Counter-Terrorism Studies. International Policy Institute for Counter-Terrorism (ICT). Retrieved 1 September 2007. ^ "PKK'nin kaynakları ve para trafiği..." [The PKK's resources and money traffic...]. Rudaw.net (in Turkish). Retrieved 24 October 2016. ^ "Terrorism > Financing of its activities". Republic of Turkey, Ministry of Foreign Affairs. Archived from the original on 6 August 2009. Retrieved 10 July 2008. ^ a b "EU Terrorism Situation and Trend Report" (PDF). Europol.europa.eu. Retrieved 28 December 2018. ^ Glenn E. Curtis; Tara Karacan (December 2002). "The nexus among terrorists, narcotics traffickers, weapons proliferators, and organized crime networks in Western Europe" (Report). Library of Congress. p. 20. Retrieved 13 July 2016. ^ "Drug trafficking > Drug trafficking and PKK". INTERPOL. Retrieved 10 July 2008. ^ a b Press Center (14 October 2009). "Treasury Designates Three Leaders of the Kongra-Gel as Significant Foreign Narcotics Traffickers". U.S. Department of the Treasury. Retrieved 23 April 2011. ^ Friedrich, Hans-Peter; Heinz Fromm (18 July 2012). "Verfassungsschutzbericht 2011". Bundesamt für Verfassungsschutz. p. 342. Retrieved 21 November 2013. ^ "Treasury Designates Five Leaders of the Kongra-Gel as Specially Designated Narcotics Traffickers". United States Department of the Treasury. 20 April 2011. Retrieved 23 April 2011. ^ Marcus, Aliza (August 2007). Blood and belief: the PKK and the Kurdish fight for independence. New York: New York University Press. pp. 183–184. ISBN 0814757111. ^ "Kurdish fighters raise flag of PKK leader in centre of Raqqa". Middle East Eye. 19 October 2017. ^ "Terror group PKK/KCK feeds off illegal drug trade". Aa.com.tr. Retrieved 27 December 2018. ^ Meho, Lokman I. (27 December 2018). "The Kurdish Question in U.S. Foreign Policy: A Documentary Sourcebook". Greenwood Publishing Group. p. 10. Retrieved 27 December 2018 – via Google Books. ^ "THE GLOBAL AFGHAN OPIUM TRADE : A Threat Assessment" (PDF). Unodc.org. Retrieved 28 December 2018. ^ "Treasury Sanctions Supporters of the Kurdistan Workers Party (PKK) Tied to Drug Trafficking in Europe". US Department of the Treasury. February 1, 2012. ^ Pike, John (21 May 2004). "Kurdistan Workers' Party (PKK)". Federation of American Scientists. Retrieved 23 July 2008. ^ "6 reasons why Turkey's war against the PKK won't last". Al-Monitor. 8 September 2015. Archived from the original on 28 March 2016. Retrieved 18 May 2016. ^ "Turkey says Greece supports PKK". Hürriyet Daily News. 7 January 1997. Retrieved 17 October 2012. ^ "Greece dogged by Öcalan affair". BBC News. 27 February 1999. Retrieved 17 October 2012. ^ a b "Syria and Iran 'backing Kurdish terrorist group', says Turkey". The Telegraph. 3 September 2012. Retrieved 17 October 2012. ^ "N. Iraq: A New Page in Foreign Policy". Hürriyet Daily News. 15 November 1998. Retrieved 17 October 2012. ^ "Russian newspaper: Russia provided money for PKK". Hürriyet Daily News. 28 February 2000. Retrieved 17 October 2012. ^ Külebi, Ali (9 October 2007). "PKK's Cooperation with the Greeks". Hürriyet Daily News. ^ "Ocalan tells Turks of Greek arms and training for PKK, say reports". The Irish Times. 23 February 1999. ^ a b "From Rep. of Turkey Ministry of Foreign Affairs". Republic of Turkey Ministry of Foreign Affairs. Archived from the original on 1 March 2016. Retrieved 18 February 2016. ^ Calabresi, Massimo (30 March 1998). "A Hellenic Haven". Time. Archived from the original on 12 February 2007. Retrieved 22 October 2007. ^ "No PKK bases in Nagorno Karabakh". Hürriyet Daily News. 21 January 2008. ^ Blank, Stephen (26 May 2008). "The Kurdish Issue and Nagorno-Karabakh". eurasianet.org. Archived from the original on 24 September 2015. Retrieved 29 September 2015. ^ "The originator of the acts of terrorism in London was standing near Tony Blair". Chechen Press. 11 May 2007. Archived from the original on 22 March 2019. Retrieved 29 June 2008. ^ "Renewal of Directions" (PDF). Archived from the original (PDF) on 19 January 2012. Retrieved 7 May 2011. ^ "Dutch police raid 'PKK paramilitary camp'". Expatica. 12 November 2004. Archived from the original on 6 December 2008. Retrieved 22 July 2008. ^ "Denmark, again? Now it is blamed for hosting Kurdish TV station". The Christian Science Monitor. 21 April 2006. Retrieved 22 February 2008. ^ Olson, Robert W (1996). The Kurdish Nationalist Movement in the 1990s: Its Impact on Turkey and the Middle East. University Press of Kentucky. p. 122. ISBN 0-8131-1999-5. ...President Mitterrand's, admittedly estranged wife Danielle. So bad had ties [France-Turkey] been at one stage that formal relations had been downgraded to the level of charge d'affaires. ^ "Avusturya teröristi uçakla Irak'a gönderdi". Hürriyet Daily News (in Turkish). Retrieved 18 July 2007. ^ a b "PKK'ya yardım eden NATO üyesi Avrupa ülkeleri var". Hürriyet Daily News (in Turkish). 22 May 2007. ^ Lacine, Sedat (14 May 2006). "The West and Terrorism: PKK as a Privileged Terrorist Organization". Journal of Turkish Weekly. International Strategic Research Organization. Archived from the original on 4 May 2008. Retrieved 29 June 2008. ^ Hersh, Seymour (26 November 2007). "The Next Act". The New Yorker. Retrieved 29 June 2008. In the past six months, Israel and the United States have also been working together in support of a Kurdish resistance group known as the Party for Free Life in Kurdistan. ^ McElroy, Damien (10 September 2007). "Kurdish guerrillas launch clandestine war in Iran". The Daily Telegraph. London. Retrieved 22 February 2008. ^ "Turkey spy agency denies role in Paris Kurds murder, launches probe". Radio France Internationale. 16 January 2014. Retrieved 5 February 2014. ^ "Turkey hails US stance on PKK leaders, seeks same in Syria". Stars and Stripes. Archived from the original on 8 November 2018. Retrieved 8 November 2018. ^ "NATO chief declares PKK terrorist group". Xinhua News Agency. 20 December 2005. ^ "The European Union's Headline Goal—Current Status". Center for Defense Information: Military Reform Project. 23 May 2002. Archived from the original on 9 March 2012. Retrieved 5 February 2014. ^ "Council Decision 2011/70/CFSP of 31 January 2011 updating the list of persons, groups and entities subject to Articles 2, 3 and 4 of Common Position 2001/931/CFSP on the application of specific measures to combat terrorism – Official Journal L 028, 02/02/2011 P. 0057 – 0059". Official Journal of the EU. Archived from the original on 22 July 2012. Retrieved 10 December 2012. ^ "Judgment of the Court of First Instance (Seventh Chamber) of 3 April 2008. Case T-229/02: Osman Öcalan acting on behalf of Kurdistan Workers' Party (PKK) v Council of the European Union". European Court of First Instance. 3 April 2008. Retrieved 5 February 2014. ^ Schomberg, William (3 April 2008). Robert Woodward, ed. "EU was wrong to include PKK on terror list". Reuters (UK). Retrieved 5 February 2014. ^ a b "Biden says Kurdish PKK is a 'terror group plain and simple'". Deutsche Welle. 23 January 2016. ^ Patterns of Global Terrorism 1993. DIANE Publishing Company. Retrieved 14 November 2011. ^ Le Roux, Gaëlle (17 October 2012). "Les Kurdes de France victimes d'un "amalgame ethnique" avec le PKK ?" (in French). France 24. Archived from the original on 14 January 2014. Retrieved 5 February 2014. ^ Demirtaş, Serkan (6 October 2011). "Turkey and France to jointly fight terrorism". Hürriyet Daily News. Retrieved 5 February 2014. ^ Balcer, Adam (2012). "An Audit of Power: Turkey's Leverage in the Post Soviet Space" (PDF). Black Sea Discussion Paper Series. Centre for Economics and Foreign Policy Studies (EDAM). Archived from the original (PDF) on 21 February 2014. Retrieved 5 February 2014. ^ "China seeks int'l support in counter-terrorism". Embassy of the People's Republic of China in the United States of America. 15 December 2003. Retrieved 5 February 2014. ^ "Australia declares PKK terrorist organization". People Daily. 16 December 2005. Retrieved 10 December 2012. ^ Walter, Christian. Terrorism as a challenge for national and international law. ISBN 3-540-21225-6. Retrieved 14 November 2011. ^ "Azerbaijan officially recognizes PKK as terrorist organization – Aliyev – PHOTOS". News.Az. 28 July 2011. Retrieved 21 November 2013. ^ "Condemnation of the PKK terrorist attack in Turkey". Czech Ministry of Foreign Affairs. 2008. ^ "ARBEITERPARTEI KURDISTANS (PKK), VOLKSKONGRESS KURDISTANS (KONGRA GEL), STRUKTUREN, ZIELE, AKTIVITÄTEN" (PDF) (in German). Archived from the original (PDF) on 2011-12-22. ^ Haeri, Safa (31 July 2004). "Erdogan Back Home From His Tehran Visit Empty Hands". Iran Press Service. Archived from the original on 19 April 2013. Retrieved 21 November 2013. ^ "Implementation of the Measures including the Freezing of Assets against Terrorists and the Like". Ministry of Foreign Affairs of Japan. 5 July 2002. Retrieved 21 November 2013. ^ "Kazakhstan Updates List of Banned Terrorist Groups". Radio Free Europe/Radio Liberty. Kazakhstan Today, Interfax-Kazakhstan. 12 October 2006. Retrieved 5 February 2014. ^ "Le Kirghizistan a connu PKK comme une organisation terroriste" (in French). Azerbaijan Press Agency. 12 June 2008. Archived from the original on 10 July 2012. Retrieved 5 February 2014. ^ Friedman, J. "DUTCH COUNTERTERRORISM EFFORTS". STATE FOR S/CT, TTIC EUR, EUR/UBI, INL JUSTICE FOR OIA. Archived from the original on 6 May 2012. Retrieved 14 November 2011. ^ "Statement of Case to Renew the Designation of Partiya Karkeren Kurdistan [PKK] as a Terrorist Entity" (PDF). New Zealand Police. 11 February 2013. Retrieved 21 November 2013. ^ "Spain arrests six Kurds suspected of financing PKK". Expatica. Agence France-Presse. 12 February 2013. Archived from the original on 21 February 2014. Retrieved 5 February 2014. ^ "UK's May uses phrase 'Kurdish terrorism' during Erdogan visit as Kurds protest in London". Kurdistan 24. 15 May 2018. ^ "Nicht mit dem Finger zeigen". St. Galler Tagblatt (in German). 7 October 2006. Archived from the original on 29 September 2007. Retrieved 5 February 2014. ^ "Bundesrat nimmt PKK an die Leine". Berner Zeitung (in German). 5 November 2008. Retrieved 5 February 2014. ^ "For Switzerland, there are no terror organizations". Jpost.com. Retrieved 27 December 2018.